Robert Rathbun Wilson (1914-2000) was an American physicist who also worked as a sculptor and architect. 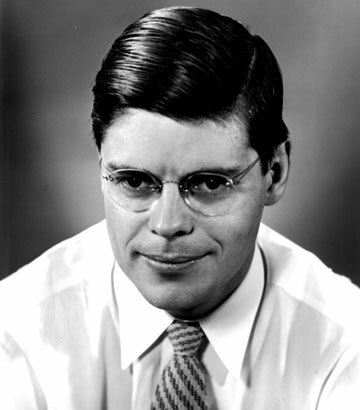 Wilson was recruited by J. Robert Oppenheimer to be the head of the cyclotron group at Los Alamos, making him the youngest group leader at the laboratory. As leader, he negotiated with James B. Conant to obtain the use of the Harvard University cyclotron for Manhattan Project work. While at Los Alamos, Wilson worked closely with Oppenheimer and Enrico Fermi and served as chairman of the town council. He also served as a courier to the Chicago Met Lab, traveling there often to meet with the scientists conducting research there. After the surrender of Nazi Germany, Wilson was one of the few scientists who questioned the propriety of continuing work on the atomic bomb, although he continued to make contributions to the project. After the bombings of Hiroshima and Nagasaki, Wilson helped organize the Association of Los Alamos Scientists (ALAS), which called for the international control of atomic energy. He later became the first director of Fermi National Accelerator Laboratory (Fermilab). 1914 Mar 4th Born in Frontier, Wyoming. 1936 Received B.A. in Physics from the University of California, Berkeley. 1940 Received Ph.D. in Physics from the University of California, Berkeley.